Kurtis is all business. You won’t find Kurtis hanging around the water cooler. That’s because he’s dashing between our digital and offset departments, flying through emails, scouring proofs and sourcing the best paper. 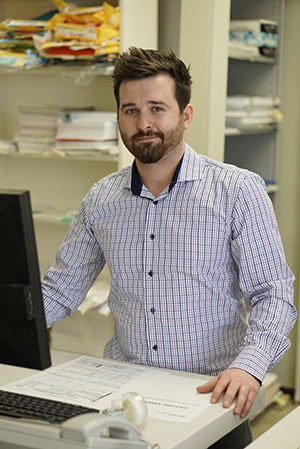 Fifteen years ago, he started out as one of the youngest owners in the industry and since then he’s been continually implementing new ways to improve quality and maximize efficiency. He’s the guy who gets your job delivered on time and looking great. Ed is the backbone of Acorn Graphics. He has been in the printing industry since before most of us were born. He started up his own print shop with his wife Sylvia, then moved into paper sales for a major distributor and eventually in 1989, became joint owner of Acorn Graphics. He is known for his kind heart, steel-trap memory and his mischievous sense of humour. His care for people is evident in the service he gives every client - big or small. Rich is a master craftsman. An offset press is only as good as the pressman who operates it. Lucky for us, we have the best pressman in town! His eye for detail, technical know-how and innate ability to run a flawless job are skills that are rarely found. 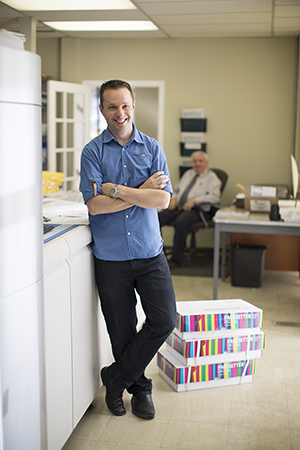 He is the reason our print materials set the industry standard for quality. 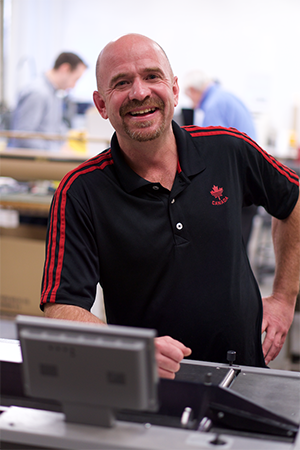 At 15 years old, Al's first job was in a paper mill near his hometown Montreal. Intrigued by the prairie province exhibit at Expo '67, he ventured west. He worked for a variety of print companies, honing his skill in press operation, camera work and film "stripping" (we're talking pre-digital age here) before settling at Acorn Graphics. He brought Ed on board in '89, and together they ran the show until passing it on to the next generation. Al continues to provide his expertise in the back shop running our smaller presses and keeping an eye on the rest of us! Harry is our entire post-press department. 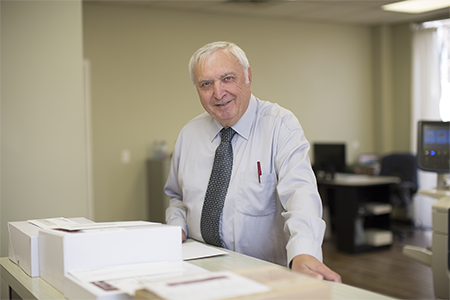 After a job is printed, it's Harry responsibility to cut, fold, collate, hole-punch, laminate, sort, box and ship. He is just one man but he accomplishes the work of many with efficiency and speed. 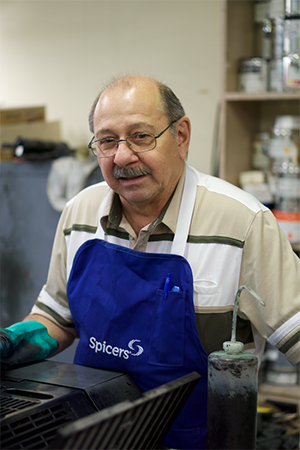 As our last set of eyes, we rely on Harry to make sure every product we deliver meets our high standards. Every so often he also provides the musical entertainment too - bonus! Connie's involvement in the print industry is multi-generational. Accounting is her main job at Acorn but you will often find her helping in the back shop - where her roots are. Growing up, Connie would join her mom on weekends and holidays at the bindery shop where she worked. Eventually, her mother started her own bindery business, unique in a highly male-dominated industry. After having her own children, Connie worked alongside her mother again helping to manage the personel, finances and daily operations of the thriving family business. 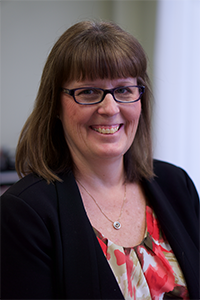 When her parents retired and sold the company, Connie stayed to ensure a smooth transition before she moved next door to support another family biz - Acorn Graphics. Logan is a key member of our design team. Before joining Acorn, Logan started his own design company focusing on logos and branding. He specializes in creating clean contemporary artwork that capitalizes on his knowledge of printing and finishing techniques. 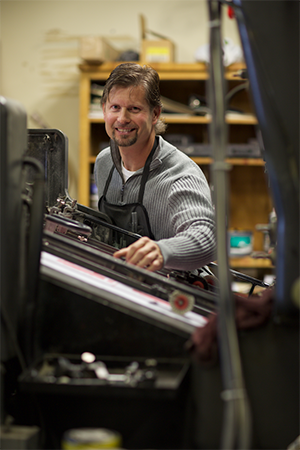 Logan also runs our digital presses and plate maker – making sure that what looks great on-screen looks even better on paper.